A handbook, a cookbook, an eggbook: this quasi-encyclopedic ovarian overview is the only tome you need to own about the indispensable egg. Eggs: star of the most important meal of the day, and, to hear billions of cooks and chefs tell it, quite possibly the world's most important food. Does that make Lucky Peach's All About Eggs the world's most important book? Probably yes. In essays, anecdotes, how-tos, and foolproof recipes, this egg-centric volume celebrates everything an egg can be and do. Whether illuminating the progress of an egg through a chicken, or teaching you how to poach the perfect egg, All About Eggs bursts with facts to deploy at your next cocktail party—then serves up a killer deviled egg recipe to serve while you’re doing it. All About Eggs is for anyone who has ever delighted in the pleasures of an omelet, marveled at the snowflake patterns on a century egg, or longed to make a sky-high soufflé. LUCKY PEACH uses food as a filter to tell stories about people, places, traditions, flavors, shared experiences, and cultural identities. Smart, thoughtful writing and influential design have made Lucky Peach’s quarterly magazine one of the world’s most trusted and fiercely loved culinary resources. In 2015, Lucky Peach expanded its mission with an award-winning website, cookbooks, and live events. 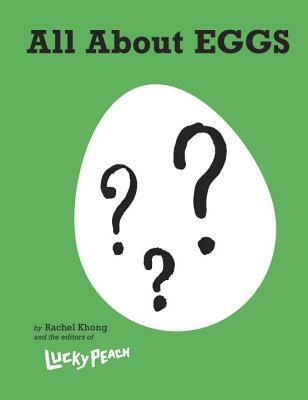 RACHEL KHONG is a contributing editor at Lucky Peach and has worked at the publication since its inception in 2011. Her debut novel, Goodbye, Vitamin, will be published by Holt in 2017. She lives in San Francisco, California.